People Power Monument located in White Plains Ave., Quezon City. 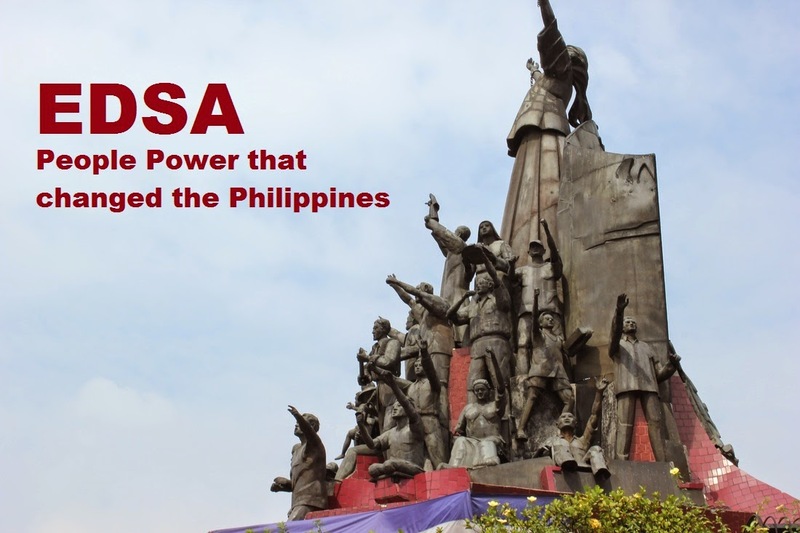 The People Power Revolution (also known as the EDSA Revolution, the Philippine Revolution of 1986, and the Yellow Revolution) was a series of popular demonstrations in the Philippines that began in 1983 and culminated in 1986. The methods used amounted to a sustained campaign of civil resistance against regime violence and electoral fraud. This case of nonviolent revolution led to the departure of President Ferdinand Marcos and the restoration of the country's democracy. It is also referred to as the Yellow Revolution due to the presence of yellow ribbons during the demonstrations following the assassination of Benigno Aquino, Jr.It was widely seen as a victory of the people against the 20-year running authoritarian, repressive regime of then president Ferdinand Marcos and made news headlines as "the revolution that surprised the world". The majority of the demonstrations took place on a long stretch of Epifanio de los Santos Avenue, more commonly known by its acronym EDSA, in Metropolitan Manila from February 22–25, 1986, and involved over two million Filipino civilians, as well as several political, military, and including religious groups led by Cardinal Jaime Sin, the Archbishop of Manila and the CBCP President Cardinal Ricardo Vidal, the Archbishop of Cebu. The protests, fueled by the resistance and opposition from years of corrupt governance by Marcos, culminated with the departure of the dictator from Malacañang Palace to the United States state of Hawaii. Corazon Aquino was proclaimed as the legitimate President of the Philippines after the revolution.